Published in Bird Observer, April 2008One newly submitted record resulted in the addition of a new species to the Massachusetts State List. 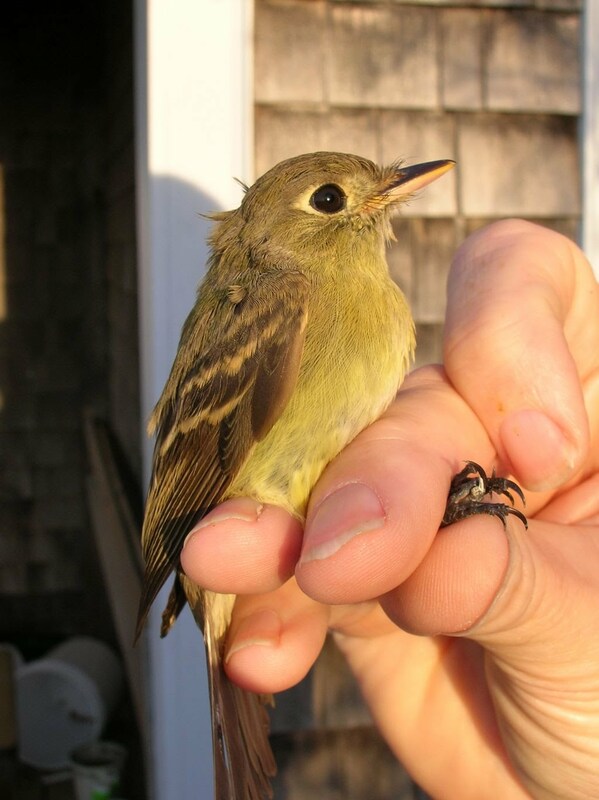 A “Western” Flycatcher was mist-netted at the Manomet Center for Conservation Sciences banding station, and excellent details were submitted. Unfortunately, the overlap in measurements and other features between Pacific-slope and Cordilleran flycatchers, a closely related species pair, made it impossible to identify the flycatcher to the species level. As time goes by and we increasingly gain greater understanding of vagrancy patterns in birds, historic reports need to be reevaluated periodically. This year the MARC reexamined several historical records; this review culminated in several changes to the State List. A 1977 record of Steller’s Eider was originally placed on the MARC Supplemental List, which states: “The MARC believes that wild individuals of these species may have occurred in the state; however, a captive origin cannot be discounted.” A resubmission of this record along with new information about the status and occurrence of this species in eastern North America convinced the Committee that there was compelling evidence to add the species to the State List of naturally occurring species. A 1999 record of Crested Caracara was originally rejected because of questionable natural occurrence. A resubmission of the record cited a pattern in the increasing number of extralimital occurrences, effectively convincing the Committee that it should be added to the State List of naturally occurring species. Four historical records of Western Wood-Pewee for Massachusetts included two individuals that were collected, although the records never underwent formal review by the Committee. Unfortunately, both of the collected specimens were ultimately destroyed by beetles, and no written record could be located that included the critical measurements of the specimens. New understanding of the differences between this species and the very similar Eastern Wood-Pewee has now called the original identification into question. Lacking the specimens and accompanying measurements, the MARC felt compelled to remove this species from the State List. Two additional sight records lacked written details. Five species initially rejected due to their questionable occurrence were added to the Supplemental List: Pink-footed Goose, Trumpeter Swan, Greater Flamingo, White-tailed Hawk, and European Goldfinch. Cackling Goose (Branta hutchinsii), #07–05, March 18, 2007, Fairhaven (Bristol), M. Lynch*, S. Carroll. (Ballot = 1, Vote: 8–1). #06–51, November 4, 2006, Amherst (Hampshire), F. Bowrys*, J. P. Smith†. (Ballot = 1, Vote: 9–0). #06–50, October 13, 2006, Turners Falls (Franklin), F. Bowrys*, J. P. Smith†. (Ballot = 1, Vote: 8–0). Because this species was just raised to full species status in 2004, the historical occurrence of Cackling Geese in Massachusetts is poorly known. Fall and winter reports have seemingly become routine. Despite the increase in reports of this species in the state, it continues on the MARC’s Review List because of the difficulty in differentiating the larger races of Cackling Goose from the smaller forms of Canada Goose. Steller’s Eider (Polysticta stelleri), #77–2R, March 29, 1977, Scituate (Plymouth), originally discovered by R. Vernon; resubmitted by W. Petersen. (Ballot = 1, Vote: 8–1). This 1977 individual was an unmistakable male seen by many, but was originally placed on the MARC Supplemental List as noted above. Steller’s Eider is an arctic species that is regularly seen in northern Europe, as well as a vagrant in Greenland and Iceland. The resubmission specifically described other occurrences of this species in eastern North America (i.e., Maine, Gulf of Saint Lawrence), in addition to reviewing its status in Europe. Steller’s Eiders are extremely rare in captivity, and the Committee agreed that the evidence of wild origin was compelling. Western Grebe (Aechmophorus occidentalis), #06–39, November 26, 2006, Revere (Suffolk), S. Zendeh*†. (Ballot = 1, Vote: 8–1). The description and photograph convinced the Committee that the very similar Clark Grebe (A. clarkii) could be eliminated, although the dissenting member postulated the possibility that the bird could have been a hybrid Western x Clark’s Grebe. “Scopoli’s” Cory’s Shearwater (Calonectris diomedea diomedea), #06–58, August 26, 2006, West of Hydrographer Canyon, R. Heil*, many photographs. (Ballot = 1, Vote: 9–0). 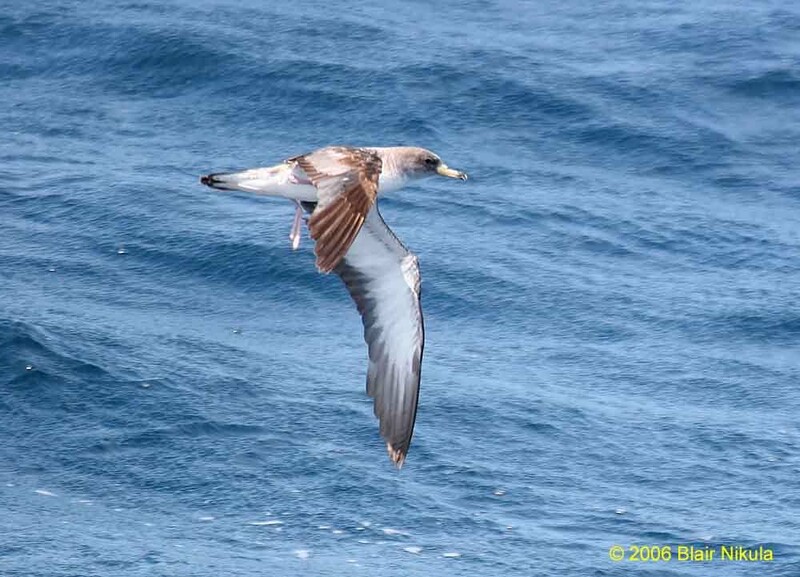 This Mediterranean subspecies of Cory’s Shearwater has been previously recorded from New York and the mid-Atlantic, but has not previously been recorded in New England waters or from those of Atlantic Canada. Picked out of a flock of Cory’s Shearwaters (C. d. borealis), the bird was described by the observer as “smaller, darker headed, with a smaller, darker bill.” Cape Verde Shearwater (C. edwardsii) was also considered, particularly since this species has recently been recorded off Cape Hatteras, North Carolina. This species was eliminated since it “has even smaller proportions, a smaller head and thinner necked look, and a dull grayish, even much more slender bill. It also has a dark-capped appearance, with a clear demarcation with the whitish throat extending up to the gape.” Excellent written documentation and high quality digital images accompanied this unique record. Brown Booby (Sula leucogaster), #05–58, Summer 2005, Hull (Plymouth), M. Quigley†. (Ballot = 1, Vote: 8–1). A nonbirder photographed this remarkable bird with his cell phone sometime during the summer of 2005. Being a nonbirder, it slipped the mind of the observer until he rediscovered the photo on his cell phone in April 2007, at which point he submitted the photo to Mass Audubon for help in identifying it. There are only three previous records of this species in the state, and it was pure serendipity that this record came to light at all. Magnificent Frigatebird (Fregata magnificens), #06–31, October 9, 2006, Tuckernuck Island (Nantucket), S. Perkins†, D. Sutherland†. (Ballot = 2, Vote: 8–1). 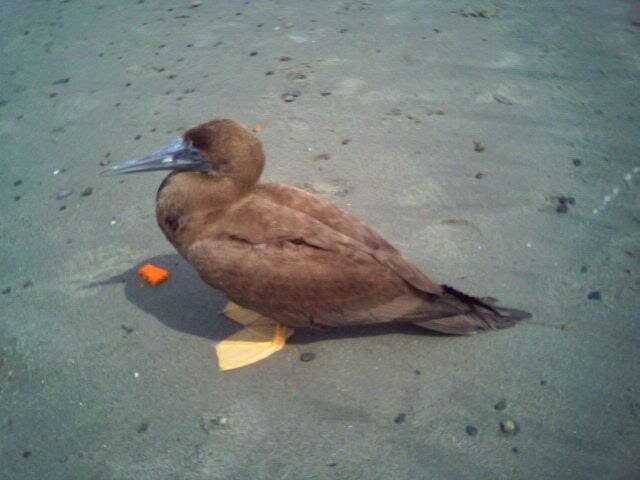 This bird was a juvenile that was photographed on Tuckernuck Island. 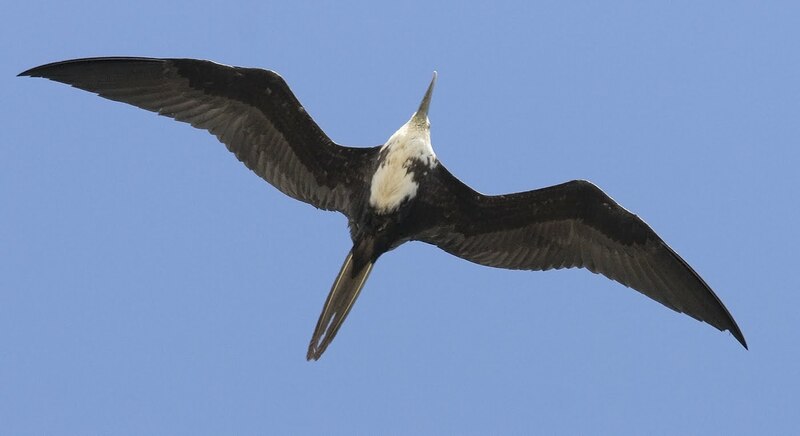 On the first ballot some committee members believed that Great (F. minor) and Lesser (F. ariel) frigatebirds, both of which have occurred in the United States, could not be eliminated. When an outside expert was consulted, it was determined that based on the appearance of molt in the flight feathers the individual must have been less than six months old. Given that a Great Frigatebird would show a rufous head at this age, the Committee voted to accept the report as a Magnificent Frigatebird. Little Blue Heron (Egretta caerulea), #06–54, December 12–26, 2006, Millbury (Worcester), R. Johnson†. (Ballot = 1, Vote: 9–0). A photograph of this immature bird clinched the identity of this out-of-season heron. Swallow-tailed Kite (Elanoides forficatus), #07–15, May 11–June 9, 2007, Rochester (Plymouth), C. Wade*†. (Ballot = 1, Vote: 9–0). Most Swallow-tailed Kites appearing in Massachusetts are typically seen on one day only, but reports of this bird encompassed nearly a month. The bird was first spotted by a backyard birder who got a clear view of it, but at the time doubted his own eyes. A month later he saw the bird again, and managed to capture unmistakable photographs. In the interim, Mass Audubon received three reports of a Swallow-tailed Kite spotted by nonbirders within a mile of this location. Crested Caracara (Caracara cheriway), #99–2R, January 1–9, 1999, Cumberland Farms fields, Middleboro (Plymouth), originally discovered and described by R. Finch, then resubmitted by W. Petersen. (Ballot = 1, Vote: 9–0). #07–09, May 14, 2007, West Tisbury (Dukes), W. Manter. (Ballot = 1, Vote: 9–0). The Annual Report initially describing the Middleboro record explained its rejection by stating: “This species . . . is highly sedentary, and its natural occurrence is questionable.” The resubmission cited the caracara’s unsuitability for falconry and noted numerous extralimital occurrences over the past decade, including several in the Northeast. The Committee agreed unanimously that there is increasingly compelling evidence for natural occurrence, and elected to accept the 1999 Middleboro report as a first state record. The West Tisbury bird was accepted as the second state record. Yellow Rail (Coturnicops noveboracensis), #06–47, December 29, 2006, Nantucket (Nantucket), R. Veit*. (Ballot = 1, Vote: 9–0). Two birds flushed from Folger Marsh on Nantucket were carefully described. One was captured by hand (!) and photographed. Black–necked Stilt (Himantopus mexicanus), #07–18, June 7–21, 2007, Chatham (Barnstable), B. Nikula*†. (Ballot = 1, Vote: 9–0). Although this species is not on the Review List, this sighting involved six individuals. There is no previous Massachusetts record of more than two individuals. Black-tailed Godwit (Limosa limosa), #07–11, July 24, 2007, South Beach Chatham (Barnstable), J. Offerman*. (Ballot = 1, Vote: 9–0). This bird was discovered feeding with three Hudsonian Godwits. The observer described both behavior and appearance, and although several members expressed disappointment that the underwing pattern was not described, the remaining description was convincing. Unfortunately, it was not seen again, despite efforts by other birders. This represents the fifth Massachusetts record. Franklin’s Gull (Larus pipixcan), #07–12, June 9, 2007, Plum Island (Essex), W. Petersen*, D. Larson*†. (Ballot = 1, Vote: 9–0). A Mass Audubon ornithology class was treated to long views of this bird in direct comparison with the similar Laughing Gull (L. pipixcan). Careful descriptions plus accompanying photographs eliminated any doubt as to its correct identification. Thayer’s Gull (Larus thayeri), #06–41, December 21–29, 2006, Provincetown (Barnstable), T. Johnson*†, J. Bosler*† et al. (ph). (Ballot = 1, Vote: 9–0). Despite the difficulties surrounding the identification of gulls in the Thayer’s/Kumlien’s/Iceland complex, this report matched perfectly the characteristics typically ascribed to Thayer’s Gull. Excellent photographs and extensive written descriptions accompanied this record. Forster’s Tern (Sterna forsteri), #06–60, December 27, 2006, Truro (Barnstable), M. Lynch*, S. Carroll. (Ballot = 1, Vote: 8–1). Although Forster’s Tern is the Sterna most often recorded in early winter, the December 27 date was noteworthy. Eurasian Collared-Dove (Streptopelia decaocto), #06–37, October 30, 2006, Chatham (Barnstable), M. Iliff*†. (Ballot = 1, Vote: 9–0). This species was originally introduced in the Bahamas, moved quickly to Florida, and has been rapidly expanding throughout the country. This is only the second state record, the first having occurred in May of 2005. The description, field sketch, and accompanying photographs clearly eliminated the very similar Ringed Turtle-Dove (S. risoria), a feral species of uncertain ancestry that is commonly kept in captivity. Chordeiles species, #06–11, April 10, 2006, Sutton (Worcester), D. Berard. (Ballot = 3, Vote: 9–0). This was submitted as Common Nighthawk (C. minor), a species that typically does not appear in Massachusetts until mid-May. The description clearly indicated a Chordeiles species, but could not conclusively eliminate other nighthawk species (e.g., Lesser Nighthawk). Although there are a few previous March and April records of Common Nighthawk, there are no known state specimens for that period, and the Committee questioned whether even some of these earlier sight records were identified correctly. 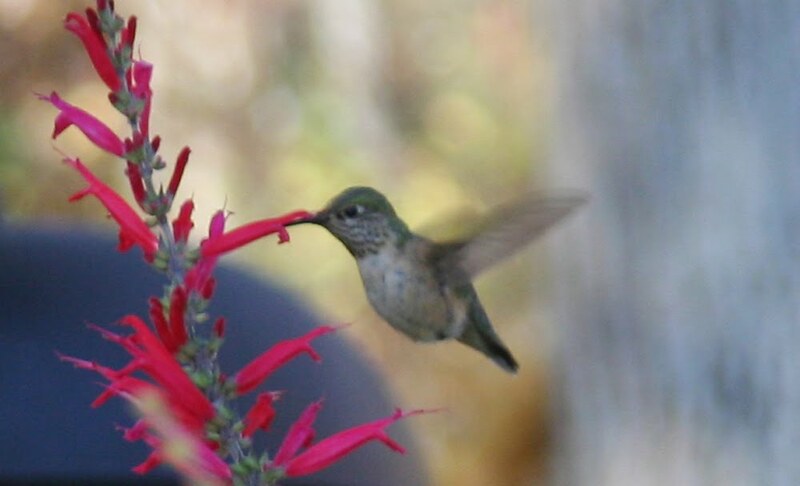 Calliope Hummingbird (Stellula calliope), #06–52, November 1–8, 2006, West Falmouth (Barnstable), P. Trimble†. (Ballot = 1, Vote: 9–0). #06–55, November 4, 2006–January 20, 2007, S. Dartmouth (Bristol), G. Dennis*†, M. Boucher*. (Ballot = 1, Vote: 9–0). #06–56, December 5, 2006–January 26, 2007, S. Dartmouth (Bristol), G. Dennis*†, M. Boucher*. (Ballot = 1, Vote: 9–0). The only previous documented record of this species was in Eastham, November 1–December 21, 2002, so the discovery of three different individuals in the fall of 2006 was astonishing. Even more so was the fact that two—a male and a female—were in South Dartmouth. All three records were well photographed and carefully documented. Both South Dartmouth Calliopes by G. Dennis. The Falmouth Calliope by P. Trimble. “Western” Flycatcher (Empidonax difficilis/occidentalis), #06–38, November 10, 2006, Manomet (Plymouth), T. Lloyd-Evans,* Ann Graham† et al. (Ballot = 1, Vote: 9–0). Pacific-slope (E. difficilis) and Cordilleran flycatchers (E. occidentalis) are virtually identical in plumage and structure, and until 1989 were considered conspecific as Western Flycatcher. The flycatcher at Manomet was mist-netted, measured, and photographed, and the details submitted to the Committee were extremely thorough. Measurements comfortably fell within the range of Cordilleran Flycatcher, but marginally overlapped those of a male (but not female) Pacific-slope Flycatcher, so the record was submitted to the MARC as “Western” Flycatcher. This is a first Massachusetts record, and one of only a handful from the northeastern United States. Other northeastern United States records from this complex include two records of Pacific-slope from Pennsylvania, a probable Pacific-slope from Virginia, and unidentified ‘Western’ Flycatchers from New Jersey and Long Island, New York. Ash-throated Flycatcher (Myiarchus cinerascens), #06–57, December 9–19, 2006, Annisquam (Essex), F. Bouchard*, J. Barber†. (Ballot = 1, Vote: 9–0). Excellent photographs eliminated other similar Myiarchus flycatchers. 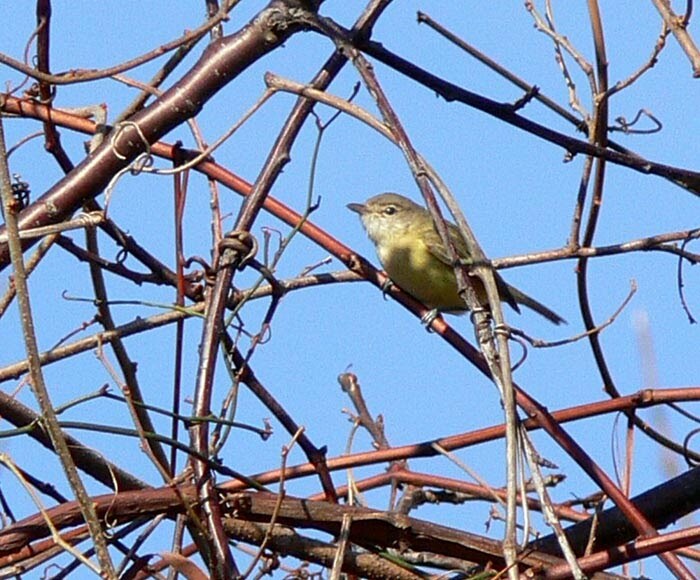 Bell’s Vireo (Vireo bellii), #06–43, November 15–December 16, 2006, Falmouth (Barnstable), G. d’Entremont* et al. (many photographs). (Ballot = 1, Vote: 9–0). Initially only briefly glimpsed by a bird club group, by size and coloration the bird was thought to be an Orange-crowned Warbler. Better looks, however, ultimately showed it to be a small vireo with a single white wing-bar. Eventually many saw the bird, and excellent written documentation and photographs were submitted. The only previous state record of this species was a bird mist-netted on two separate days at Manomet in October 2005, but never seen in the field. Northern Wheatear (Oenanthe oenanthe), #07–19, June 10, 2007, Salisbury (Essex), M. Pitcher*. (Ballot = 1, Vote: 9–0). This report was initially submitted to eBird, an Internet site where bird sightings can be submitted electronically. The observer was RV camping at Salisbury Beach State Park when she began to feel “cabin fever” after five days of rain. She was taking a walk with umbrella and binoculars in hand when she saw a bird she didn’t recognize and called her husband in the camper to describe the bird. After checking the field guide, he told her the bird had to be a wheatear. The descriptions of the bird and its behavior were excellent. Northern Wheatear is very rare in Massachusetts in the spring. “Audubon’s” Yellow-rumped Warbler (Dendroica coronata auduboni), #06–42, December 23, 2006–April 10, 2007, Eastham (Barnstable), J. Hanson*†. A bird visiting a feeder was carefully described and photographed. There are fewer than twenty documented records of this western subspecies in Massachusetts. Black-throated Gray Warbler (Dendroica nigrescens), #07–04, February 1–4, 2007, Nantucket (Nantucket), E. Andrews* et al. (Ballot = 1, Vote: 9–0). A “mystery bird” showed up at a Nantucket feeder, and the observer called an experienced birder who identified it as a Black-throated Gray Warbler. The description and accompanying field sketch were convincing. Townsend’s Warbler (Dendroica townsendi), #07–06, January 22–April 1, 2007, Cambridge (Middlesex), R. Stymeist*, many photographs. (Ballot = 1, Vote: 9–0). 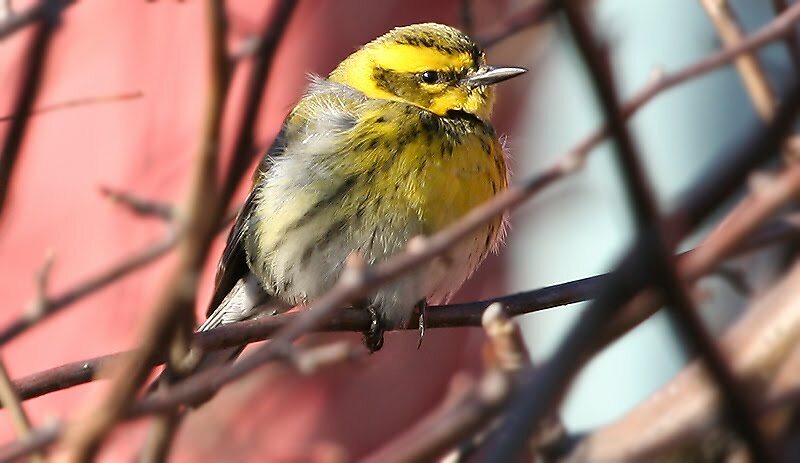 After reading an email report of a possible out-of-season Black-throated Green Warbler, an experienced birder suspected a vagrant, went to check it out, and discovered it was a Townsend’s Warbler. The homeowners who originally reported the bird provided it with a constant diet of meal worms for over two months, during which time it was seen and photographed by many. 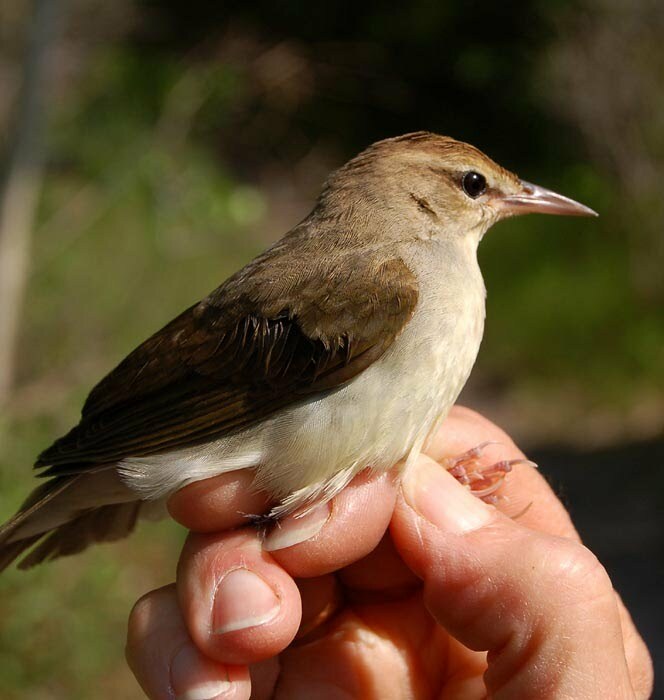 Swainson’s Warbler (Limnothlypis swainsonii), #07–17, May 23–29, 2007, Plum Island (Essex), T. Wetmore*, J. Standley†. (Ballot = 1, Vote: 9–0). This bird was first heard singing on May 23, puzzling listeners who concluded it was a Louisiana Waterthrush singing an aberrant song. The following day, a different birder caught a glimpse of the bird and speculated that it might have been a Swainson’s Warbler, but was unable to get a definitive view and left the bird as unknown. Later that day, however, it was mist-netted and conclusively identified and photographed. Although it was often heard singing over the next few days, it stayed out of sight most of the time. 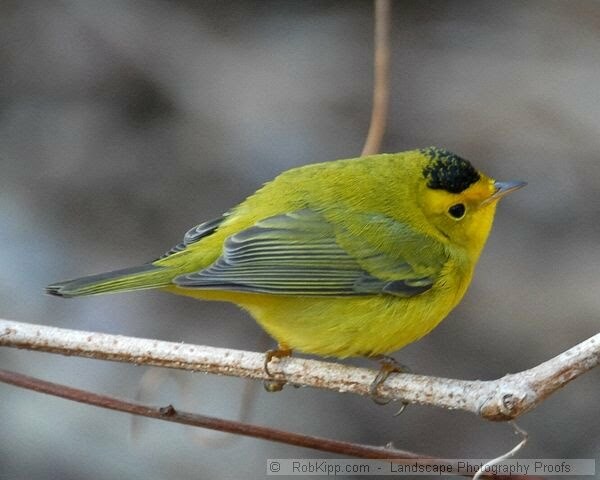 “Western” Wilson’s Warbler (Wilsonia pusilla chryseola/pileolata), #07–07, January 2–February 14, 2007, Nahant (Essex), L. Pivacek*, many photographs (Ballot = 1, Vote: 9–0). The observer saw this bird on several previous occasions, but on January 10 she got excellent views and suspected it to be one of the western subspecies. The bird was very bright, with orange tones on the forehead, chin, and upper breast. Photographs were sent to experts who concurred that it was one of the western subspecies, but it was never possible to determine whether it was of the race chryseola or pileolata. There are no previous documented records of either of these subspecies in Massachusetts. Western Tanager (Piranga ludoviciana), #06–59, September 28, 2006, Dartmouth (Bristol), R. Stymeist*, K. Hartel*. (Ballot = 1, Vote: 9–0). A male in high plumage was well described by two experienced observers. 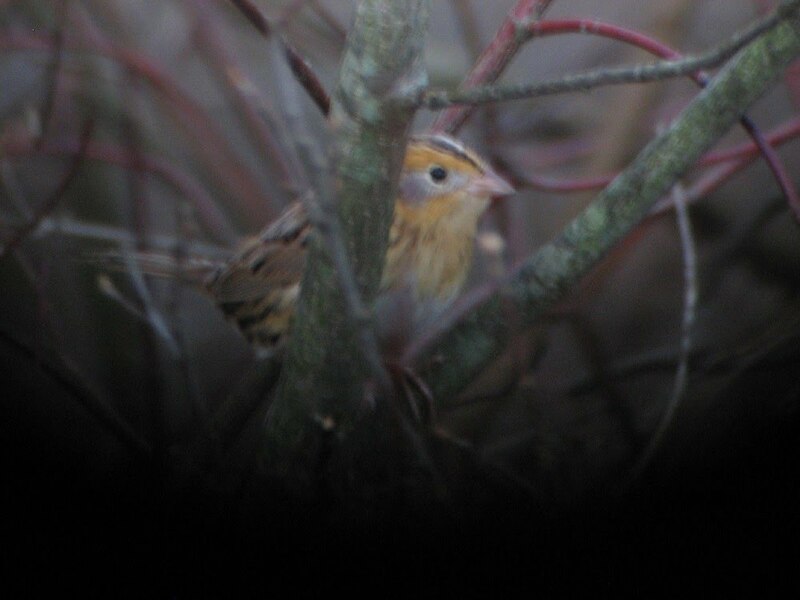 Le Conte’s Sparrow (Ammodramus leconteii), #06–40, November 15, 2006, Lincoln (Middlesex), N. Soulette*†. (Ballot = 1, Vote: 9–0). When an orangy-colored Ammodramus sparrow popped out of the weeds, the observer was not sure at first whether it was a Le Conte’s or a Nelson’s Sharp-tailed sparrow. She studied the bird carefully, then rushed home to consult a field guide. Certain now that it was a Le Conte’s Sparrow, she returned with a telescope and camera and was able to confirm all field marks and capture images showing all the key field marks. 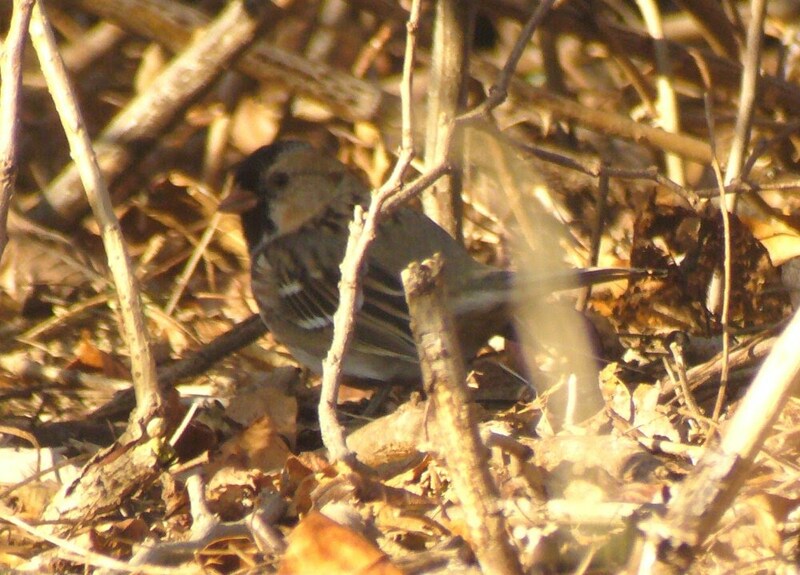 Harris’s Sparrow (Zonotrichia querula), #06–44, December 27–May 7, 2007, Georgetown (Essex), A. O’Hare*, D. Larson*†. (Ballot = 1, Vote: 9–0). A Harris’s Sparrow visiting a backyard feeder was seen by a number of people, well described, and photographed. 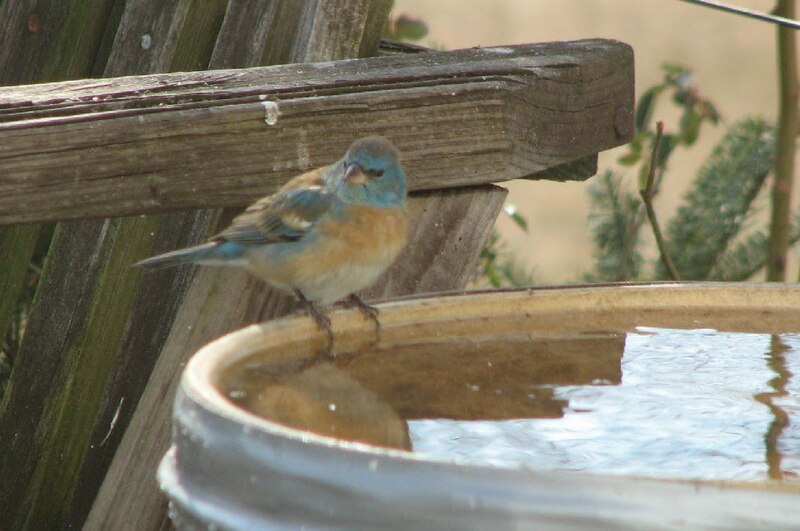 Lazuli Bunting (Passerina amoena), #07–01, January 30–31, 2007, Hadley (Hampshire), L. Currin†. (Ballot = 1, Vote: 9–0). When this bird appeared at a backyard feeder, the homeowners took photos, sent them to an experienced local birder, and asked if the bird was unusual. The birder instantly recognized the bird as a male Lazuli Bunting. Unfortunately the photos were ten days old, and the bird was never relocated. This is only the second state record for this handsome western vagrant. Painted Bunting (Passerina ciris), #06–46, November 25–December 4, 2006, Huntington (Hampshire), S. Hamlin*†, M. Lynch*. (Ballot = 1, Vote: 9–0). 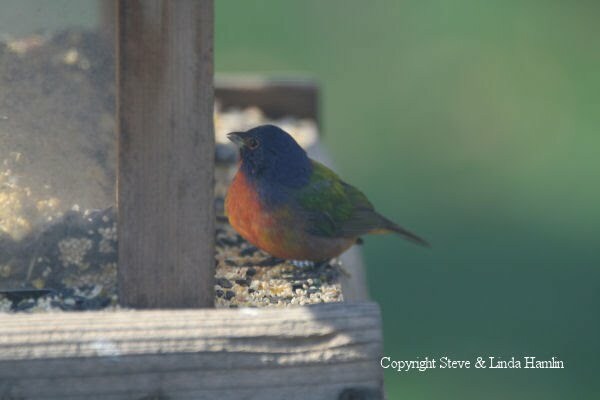 A male Painted Bunting visiting a feeder in Huntington was photographed and clearly described. Pacific Loon (Gavia pacifica), #06–49, November 19, 2006, Hull (Plymouth). (Ballot = 2, Vote: 4–5). #06–45, December 17, 2006, Rockport (A.P.) (Essex). (Ballot = 2, Vote: 3–6). Loon identification can be notoriously problematic, and the details submitted did not adequately eliminate other species. Western Grebe (Aechmophorus occidentalis), #07–03, January 7, 2007, Plum Island (Essex). (Ballot = 1, Vote: 1–8). Although Committee members agreed it was an Aechmophorus grebe, the description did not rule out the very similar Clark’s Grebe (A. clarkii), which has been recorded at least twice on the East Coast in recent years, including a record in Maine. Anhinga (Anhinga anhinga), #07–10, June 29, 2007, Wellesley (Norfolk). (Ballot = 1, Vote: 3–6). Details of a soaring bird were too sketchy for the Committee to accept this report of such a rare species. Sandwich Tern (Thalasseus sandvicensis), #07–14, June 23, 2007, Provincetown (Barnstable). (Ballot = 1, Vote: 1–8). Details were very sparse on a bird seen at a considerable distance. Skua species #06–53, July 22, 2006, Stellwagen Bank, (Ballot = 1, Vote: 3–6). The description of two birds together did not conclusively eliminate large, dark Pomarine Jaegers. Selasphorus species #05–57, August 21, 2005, Eastham (Barnstable), (Ballot = 2, Vote: 3–6). The identification was largely based on seeing “rusty orange/brown” on the back, and the Committee believed it did not rule out Ruby-throated Hummingbird (Archilochus colubris), which can often show coppery highlights. Swainson’s Warbler (Limnothlypis swainsonii), #05–42, 9/25/05, Provincetown (Barnstable). (Ballot = 3, Vote: 4–5). #07–08, 5/11/07, Mount Auburn, Cambridge (Middlesex). (Ballot = 1, Vote: 1–8). The Provincetown bird, although well described, failed to include several key field marks, and the Committee believed it did not meet the threshold needed for such a rare species. The description of the Cambridge bird was sketchy and failed to rule out Carolina Wren as an alternative possibility. Western Wood-Pewee (Contopus sordidulus), #66–02A, August 29, 1966, Monomoy (Barnstable), J. Baird. (Remove from state list, Vote: 2–7). When the MARC was first formed, many species were added to the state list by a voice vote instead of by formal written report. Many of these were commonly occurring species, and others bypassed formal submission based on photographs, multiple observers, specimens, or mist-netted and measured birds. Western Wood-Pewee was added to the list based on two birds mist-netted on Monomoy only two weeks apart, August 29 and September 11, 1966. Both individuals were collected and placed in the collection of Mass Audubon, but unfortunately beetles destroyed both specimens. Since that time, uncertainty has arisen regarding the criteria for differentiating Western and Eastern Wood-Pewee (C. virens), so the Committee decided to formally review the records. Unfortunately, no record could be found of the original measurements of these birds, and since the specimens are no longer extant, the Committee was compelled to remove Western Wood-Pewee from the State List. Two sight and voice records of this species (Monomoy, May 1976, and Morris Island in Chatham, May 1980) were not accompanied by written details. The author thanks Wayne Petersen, Jeremiah Trimble, Davis Finch, and Blair Nikula for editorial assistance.